Unionville’s Joe Fariello fins running room against Academy Park. EAST MARLBOROUGH — Apparently, lightning does not strike twice. 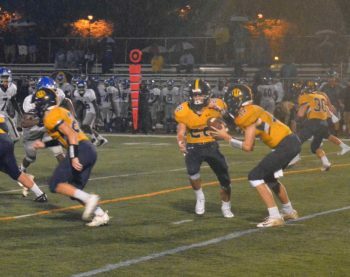 Although Unionville mounted a furious, final two-minute rally, to almost come from behind against Academy Park, eerily like last season’s game, the Indians fell short, losing 19-14, when a final drive stalled in the last 30 seconds of a game delayed by lighting in the area at the scheduled kickoff time. Although the loss was a frustrating one for the defending District One, 5A champs, it was evident that (0-2) Unionville found a higher gear in the second half and nearly overcame a deficit against one of the top teams, the 2-0 Knights, in the district. The overall performance was a big step up from the season-opening los to Garnet Valley. Unionville Quarterback Blake Charlton hands off to Connor Schilling. And after a lackluster first half — dominated by pouring rain — the Indians began to play better, especially on defense, as the rains eased and the young team began to find itself. Yes, the echoes of last years’ 23-20 win by Unionville started to get louder in the final quarter, when trailing 19-0, the Indians finally found themselves. Gabe McLaughlin stripped Knights’ QB Skylor Fillis, forcing a fumble that Cole Sheehan fell on the endzone, lighting a flicker of hope. After moving the ball much of the night, but stalling — notably a drive that failed deep in Knights’ territory late in the first half — the Indians offense was able to put together a sustained drive. After QB Blake Charlton scored on a one-yard run, the flicker turned into a serious flame. Moments later, the flame roared when Eli Lyons managed to recover the ensuing onside kick — and suddenly, remarkably, Unionville had a chance to roar from behind and win. 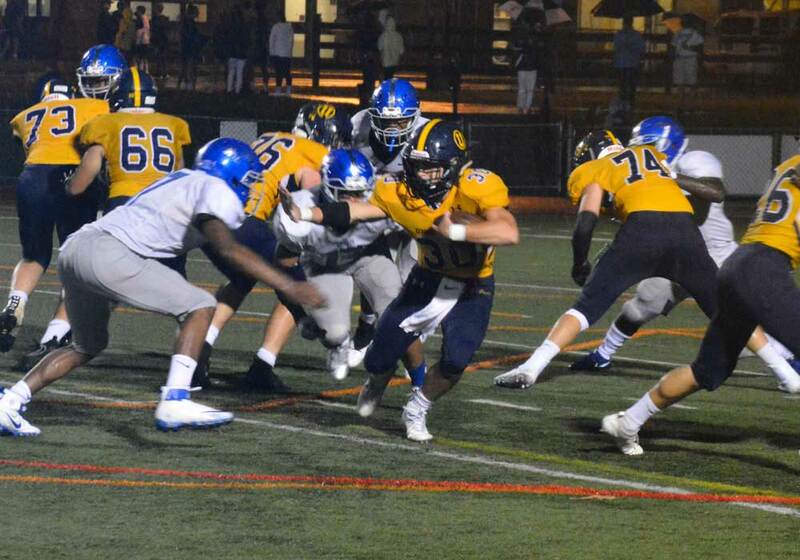 But with the ball at midfield, Academy Park’s Tyree Estes ripped through an offensive line that struggled at times throughout the game, and sacked Charlton, burying Unionville deep in its own end. Unable to move the ball, the drive stalled and the Indians turned the ball over on downs in the closing seconds. Although unhappy about the loss, now equalling the number of losses in 2017’s 13-2 campaign, Clark said he thought his team had turned a quarter and really learned what it takes to play varsity football. With a tough rival, Avon Grove, coming up next week, that’s a crucial step forward.